Most bait products registered for use on wild dogs in WA use sodium fluoroacetate (1080) as their active ingredient. Landholders have certain obligations under the code of practice for the safe use and management of 1080 in Western Australia. Warning: 1080 is an extremely dangerous toxin so great care is required with its use. Under the Biosecurity and Agricultural Management Act 2007 (BAM Act) landholders - landowners and occupiers - are responsible for wild dog control on their properties. When undertaking vertebrate pest control, the most humane method available must be used (see Animal welfare - Baits and poisons). Wild dog control with 1080 is done by using meat laced baits carefully placed in selected locations through burying or hiding, or administered via canid pest ejectors. 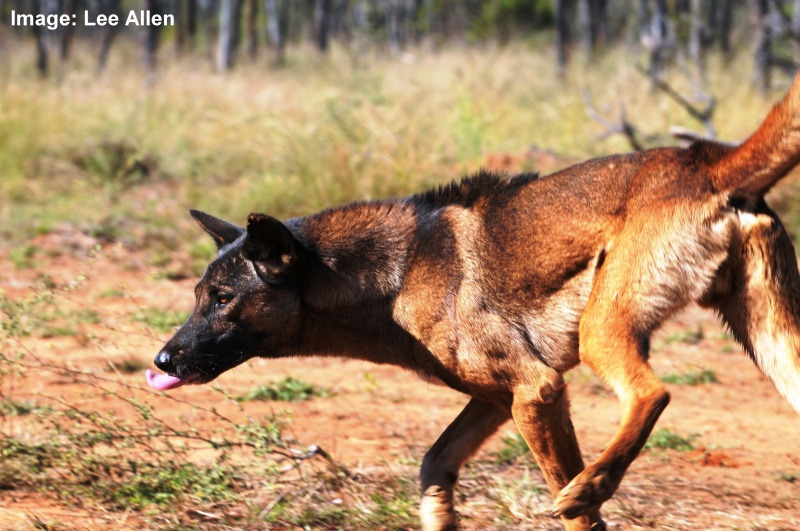 Wild dogs have a low tolerance to 1080, while many Western Australian native wildlife has a high level of resistance as a result of co-evolution with fluoroacetate-bearing native plants. The dosage used therefore is low and specifically targetted to wild dog levels. Additionally, it is is safe in the environment, as it dilutes into harmless compounds in water and gets eaten by the bacteria in soil. Information on 1080 registered bait products for wild dog control as well as the rates to be laid are described in the information sheet: Rates of lay for 1080/strychnine products. For more information on why 1080 is used in WA, watch this animation produced by the Centre for Invasive Species Solutions. Only authorised DAFWA officers can authorise the supply and use of 1080. Only authorised persons trained in the safe use and handling of 1080 can be authorised to receive and use 1080. 1080 can only be used on the land identified on your application and approved by an authorised DAFWA officer. 1080 is only available from licensed S7 retail outlets. The use of 1080 baits require careful management of the baits and of the carcasses of dead animals to avoid poisoning of non-native domestic animals (see 1080 characteristics and use). 1080 (sodium fluoroacetate) is a Schedule 7 poison and a restricted chemical product. In WA its use and supply is bound by the Code of practice for the safe use and management of 1080 in Western Australia. Additional information on how to access bait, poison and toxin (bait) products, training required, animal welfare considerations and legal requirements, see the Bait and poison directory for vertebrate pests in Western Australia web pages.